When identifying treatment options and developing treatment plans, it is important to consider the method of proton-beam delivery. 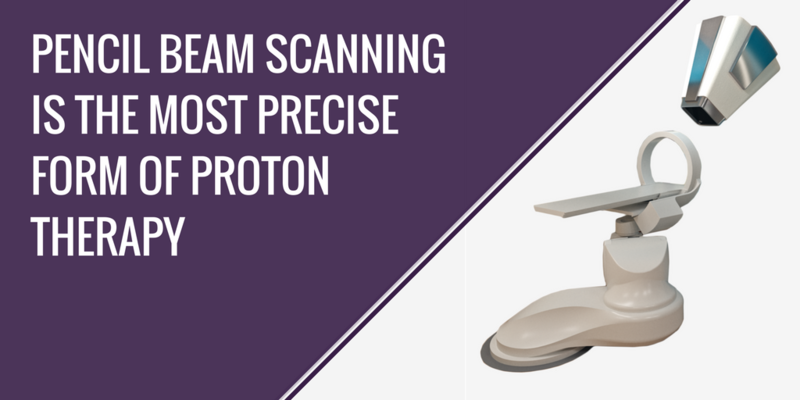 There are three types of proton-beam delivery methods: passive scattering, uniform scanning, and pencil beam scanning. When identifying treatment options and developing treatment plans, it is important to consider the method of proton-beam delivery. Pencil beam is the most modern form of delivering proton beams to patients. Pencil beam scanning (PBS) is the most precise form of proton therapy. Using an electronically guided scanning system and magnets, PBS delivers proton therapy treatment via a proton beam that is just millimeters wide. With PBS, beam position and depth are able to be controlled, allowing for highly precise deposition of radiation to be delivered in all three dimensions of the tumor. PBS does not require the use of patient-specific or field-specific devices (apertures, compensators) in the delivery of proton therapy treatment. This eliminates treatment delays, reduces treatment time, reduces costs, increases flexibility in treatment delivery, and reduces patient exposure to secondary radiation produced when the beam hits a device. Delivery of proton therapy treatment with passive scattering or uniform scanning requires the use of patient-specific devices to conform the dose to the treatment volume. Unique devices are needed for each patient and for each treatment beam, because the shape of the tumor is unique to each patient, and because body composition can change during treatment, it is often necessary to create new devices over the course of treatment. Whether the manufacturing of these devices occurs in-house or is outsourced, treatment cannot begin until the devices are in hand. When evaluating proton beam delivery methods, both treatment delays and costs related to device manufacture must be considered. It is also important to consider the increase in treatment time and secondary radiation due to the use of the devices. As discussed above, it is necessary to use a different device for the delivery of each treatment beam. Switching devices for the treatment of each tumor field takes time, thereby increasing treatment time. Further, the secondary radiation that results increases the integral radiation dose to the patient. Neutrons are generated when a proton beam hits a device. Radiation that does not directly target the tumor is undesirable, especially when treating pediatric patients as they have an increased risk of developing neutron-induced secondary cancers later in life. Finally, because the devices are exposed to radiation during treatment, and become radioactive, they need to be stored for a period of time before they can be disposed of. The cost and space associated with storing these devices, and their environmental impact, must be considered when evaluating the delivery methods of proton therapy treatment. PBS delivers superior dose sculpting and higher beam efficiencies than other methods of proton beam delivery. This reduces unwanted side effects, improves long-term outcomes for patients, and improves the patient’s quality of life. The method of proton beam delivery employed by PBS allows for a sharper Bragg peak than passive scattering – allowing for the treatment of deep-seated tumors. One of the biggest advantages of PBS is that each proton beam can be controlled in terms of position and intensity. The delivery of highly inhomogeneous treatment volumes is unique to PBS and allows for superior dose sculpting. Additionally, PBS can achieve beam efficiencies of close to 100%, while the beam efficiencies of passive scattering are typically between 3% and 15%. Pediatric patients and patients with irregularly shaped tumors or tumors that are in close proximity to organs, critical structures, or significant normal tissue will benefit most from PBS. Radiance 330 delivers vanguard proton therapy treatment with the precision of pencil-beam scanning and the power of integrated imaging. Designed to increase accessibility, Radiance 330 is compact, modular, and scalable. And with low capital and operating costs, Radiance 330 delivers the industry’s fastest return on investment. W P Levin, H Kooy, J S Loeffler, T F DeLaney. “Proton Beam Therapy.” Br J Cancer. 2005 Oct 17; 93(8): 849–854. Pencil-Beam Scanning Enhances Precision. Medical Physics Web. June 3, 2013. W P Levin, H Kooy, J S Loeffler, T F DeLaney. “Proton Beam Therapy.”Br J Cancer. 2005 Oct 17; 93(8): 849–854. University of Pennsylvania School of Medicine. “Studies point to clinical advantages of proton therapy: Studies demonstrated lower toxicities, positive survival outcomes for lung, pancreatic and spine cancers.” ScienceDaily. Paganetti H. Assessment of the risk for developing a second malignancy from scattered and secondary radiation in radiation therapy. Health Phys. 2012 Nov;103(5):652-61. Ahn, P. et al. A Comparative Quality of Life Cohort of Oropharyngeal Squamous Cell (OPSCC) Patients Treated With Volumetric Modulated Radiation Therapy (VMAT) Versus Proton Pencil Beam Scanning (PBS) International Journal of Radiation Oncology • Biology • Physics, Volume 93, Issue 3, S71. Paganetti H. Proton Beam Therapy. physicsworld Discovery. 2017.